Includes the Star Trek Theme, Mission Impossible Theme, as well as Nimoy singing "Twinkle Twinkle Little Earth" and "Where Is Love?" 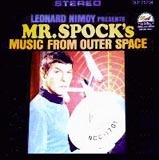 Leonard Nimoy sings "If I Had a Hammer", "Proud Mary" and others. A "best of" collection from Spock and Kirk's dubious flirtations with singing careers.